Septic Tanks are designed to collect sewage and wastewater from households that are not connected to the mains sewer. The tank itself comprises of two chambers and, as wastewater and sewage enters the tank, solids are encouraged to settle at the bottom and begin to decompose in the lower chamber. Meanwhile, liquors flow through to a second chamber to allow any smaller suspended solids to settle before exiting the tank through the soak away system and into the environment, subject to consent to discharge issued by the Environment Agency. 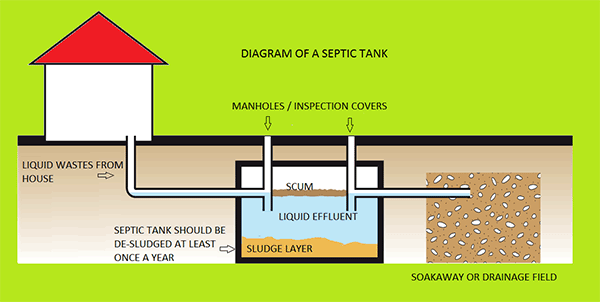 Septic Tanks do not require full emptying, however, they need to be 'de-sludged'. This process involves removing the solids or sludge from the system but leaving enough water for the system to continue to operate efficiently. We have been supporting households with septic tanks for over 75 years and performing regular health checks to keep systems in perfect working order. We offer a fast, friendly and efficient service for customers who depend on us for their septic tank clearances. For help with a blocked system, or if you simply need advice from the experts in domestic sewage collection, look no further! Our operatives are all highly experienced, and we're also fully licensed by the Environment Agency to give you complete peace of mind.